Auto Racing is a top-down driving game that was the main inspiration for Rally Speedway (1983, Atari 8-bit). There are five tracks of increasing difficulty as well as five cars with different handling and acceleration. In the 1-player mode your challenge is to complete five laps in the quickest possible time. The first few tracks aren't too tough but things get really tricky in tracks 4-5 with the latter having some seriously sharp turns. Your car automatically accelerates and you can choose to brake at any point by pressing the Side-Down button. Steering is generally where people have issues but you don't need to constantly hold a direction; instead you only want to press the directional pad when needed. When you do come to a corner you should lightly tap the bottom left or bottom right of the d-pad to turn. This method works really well when you get used to it and before long you'll be whizzing around the tracks with ease. One problem is that the hud showing how many laps you've completed and your current time isn't displayed until you either crash or reach the finish line. It's a strange decision as having these stats available would help regular players to track their progress as they race. The 2-player mode is absolutely brilliant and resembles an early version of Micro Machines (1993, Mega Drive). The objective is to score 50 points and you get 2 points every time your opponent crashes or if you're far enough in front to reach the edge of the screen. In terms of negatives, the scrolling is very jerky at times which can be disorientating and the SFX range from mildly annoying (the screeching of your brakes) to a real nuisance (the sound of your engine). Auto Racing is an underrated game with great depth and it's a shame that so many people dismiss it due to how badly the manual explains the steering controls. Once you get used to them you'll have a great time, especially in the 2-player mode which is very addictive. 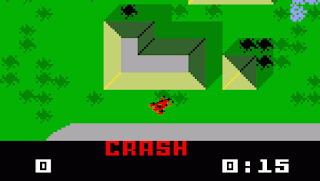 Random trivia: The game has been re-released a few times such as on the Intellivision Lives! compilation (1999, PC) and on Microsoft's Game Room (2010, Xbox 360).